Details of the ban are here. South of the border, the Conservative government of Britain has thrown open the door to GM crops. In April, the European Commission reversed an earlier ban and approved the import of 10 new GM crops for human and animal consumption, including corn, soybeans, cotton and canola oil. Meanwhile in the USA, the House of Representatives has just passed the perversely named “Safe and Accurate Food Labeling Act,” which prohibits state and local authorities from requiring safe and accurate GMO labeling. By now it’s clear that when consumers know about GMOs, they tend to be skeptical. But when they don’t know… It’s unlikely the Act will encounter any resistance in the Senate or the White House, both deeply beholden to the agri-chemical leviathans. There is just one fly in the banning-GMOs ointment, but it’s a big one: Under massive international trade agreements like the Trans-Atlantic Trade and Investment Partnership (TTIP), negotiated in secret by corporate lobbies, corporations can sue any government bold enough to enact sensible, democratic measures meant to protect the public and the earth if there’s a chance they might limit actual or even potential corporate profits. A ban on GM crops is as likely a target as any. Still, in taking responsible action, governments of countries like Scotland and Russia set an inspiring example of what is possible. For a sane conversation on genetic manipulation and food security, visit Canadian scientist/farmer Ann Clark in Bold Scientists, here. Scroll down to chapter 2, Digging for thistles. Categories: Campaigns, Conservation, Conservation biology, Corporate, Current affairs, Ecology, Endangered species, Environment, Ethics, Genetic engineering, Government policy, Health, Industrial agriculture, Organic agriculture, Science, Sustainability, Uncategorized, Water protection | Tags: Ann Clark, Bold Scientists, Britain, corporate agenda, corporate lobbies, Dmitry Medvedev, Ethics, European Commission, Food and Rural Affairs Richard Lochhead, genetic engineering, genetically modified organisms, GM crops, GMOs, HR 1559, Member of the Scottish Parliament Alison Johnstone, Minister for the Environment, Monsanto, nature, plant agriculture, Roundup, Russia, Safe and Accurate Food Labeling Act, science, Scotland, technology, Trans-Atlantic Trade and Investment Partnership, TTIP, US House of Representatives | Permalink. Bees keep us alive. They and other insects pollinate two-thirds of all food crops. No pollination, no food crops. 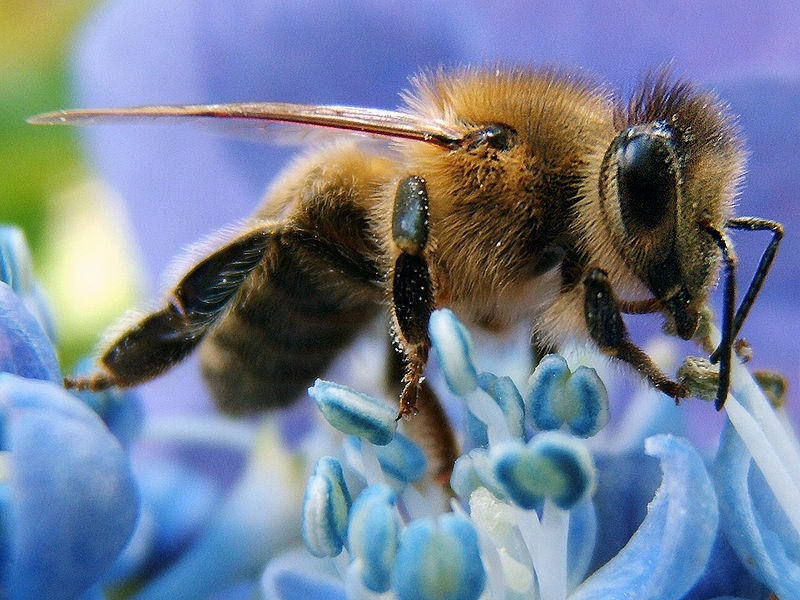 Bees and other pollinators are in great peril, their populations in sharp decline worldwide. A growing body of evidence identifies neonicotinoids, chemical pesticides that impair the neurological systems of insects, as a key factor in the decline. Some of these chemicals are already banned or restricted in several European countries. Yet neonicotinoids remain the most widely used pesticides on earth, generating enormous profits. “Your words are changed, your papers are censored or edited, or you are not allowed to submit them at all.” – a senior scientist at the US Department of Agriculture Research Service. “Censorship and harassment poison good science and good policy.” – Lori Ann Burd, environmental health director at the Center for Biological Diversity. Follow the Honey, a report from Friends of the Earth, exposes how agrochemical corporations obscure links between their chemicals and pollinator decline, and block government regulation. Read it here. For more on the battle for honest science, have a look inside Bold Scientists. Categories: Bold Scientists, Campaigns, Conservation, Conservation biology, Corporate, Current affairs, Ecology, Endangered species, Environment, Ethics, Government policy, Industrial agriculture, Organic agriculture, Pharmaceuticals, Propaganda, Science, Scientific integrity, Scientific research, Sustainability | Tags: bee colony collapse, bees, Bold Scientists, Center for Biological Diversity, corporate agenda, Friends of the Earth, honey, honey bees, Lori Ann Burd, nature, neonicotinoids, pesticides, plant agriculture, pollination, science, scientific objectivity, US Department of Agriculture, USDA, War on science | Permalink. Lobbyist claims Monsanto pesticide safe to drink, bolts when offered a glass. (It’s caught on a gem of a video, embedded in the story). Raw Story, 27 March 2015. Monsanto demands World Health Organization retract report on Roundup link to cancer. EcoWatch, 26 March 2015. For a good dose of sanity on GMOs, hunger, and post-oil farming, check out Ann Clark, plant physiologist and farmer, in Bold Scientists. Read an excerpt here. Meantime, pass this on. And have a nice day. Categories: Bold Scientists, Corporate, Current affairs, Ecology, Environment, Environmental, Ethics, Genetic engineering, Industrial agriculture, Justice, Organic agriculture, Propaganda, Science, Scientific integrity, Sustainability, Technology, Uncategorized | Tags: Ann Clark, Bold Scientists, corporate agenda, Ethics, genetic engineering, genetically modified organisms, GMOs, hunger, Monsanto, nature, organic agriculture, Patrick Moore, plant agriculture, post-oil farming, resistance, Roundup, science, technology, WHO, World Health Organization | Permalink. A rare victory, and an inspiring model for farmers everywhere. Categories: Bold Scientists, Conservation, Corporate, Current affairs, Ecology, Economic, Environment, Ethics, Genetic engineering, Health, Human Rights, Industrial agriculture, Justice, Organic agriculture, Sustainability, Uncategorized | Tags: agriculture, chemical agriculture, climate disruption, corporate agenda, Dow corporation, El Salvador, farmers, genetic engineering, genetically modified organisms, global warming, GMOs, local seeds, Monsanto, nature, plant agriculture, resistance, Roundup | Permalink. The corporate leviathans that brought us GM crops promised no pollen spread. Fact: Any place these invasive crops are planted they spread pollen as far as wind and bugs can carry it, making it impossible to grow non-genetically manipulated crops for miles around. The industry promised that GM herbicide-tolerant crops would need less chemicals to suppress competing weeds. Nature laughed. Fact: Very quickly, weeds developed tolerance to the most widely used herbicide, glyphosate. The resulting ‘superweeds’ already infest an estimated 70 million acres of US farmland, and they’re spreading rapidly. It’s being called an agricultural crisis. Another one. The corporate solution to the new problem: Throw more chemicals at it. No surprise, chemicals induce dependency and generate enormous profits. The pushers are pushing hard – not that it takes much pressure – to get US government approval to sell the highly toxic 2,4-D herbicide/defoliant, infamous as a weapon of mass destruction in the US war on Viet Nam. At the same time, the industry plans to release GM crops.2, corn and soybeans genetically manipulated to tolerate repeated dousing with multiple herbicides, including 2,4-D. Details here, in Wired: http://www.wired.com/2014/09/new-gm-crops/. For a saner path, stop in for a visit with Ann Clark, plant physiologist and post-oil farmer, in Bold Scientists, chapter 2, Digging thistles. Read an excerpt here. Categories: Bold Scientists, Corporate, Ecology, Environment, Environmental, Genetic engineering, Government policy, Industrial agriculture, Justice, Organic agriculture, Sustainability, Uncategorized | Tags: 2-4-D, Ann Clark, Bold Scientists, corporate agenda, defoliants, genetically modified organisms, GMOs, herbicide tolerance, herbicides, Monsanto, plant agriculture, post-oil, Roundup, superweeds, Viet Nam | Permalink. In late summer 2013, we saw only three or four of these beautiful butterflies in our eastern Ontario garden, a stunning loss that many other people have confirmed. Here’s why. It’s a sad, infuriating story of nature, science and power abused. Deeply entwined with our own, the story of the Monarchs is bleak, but not finished. A new report from the World Wildlife Fund and Mexico’s National Commission for Protected Areas found that the number of monarch butterflies hibernating in Mexico dropped to its lowest level since records began in 1993. The insects make an epic journey of thousands of miles each year from Canada and the U.S. to spend November through March hibernating in Mexico’s temperate forests. Clues that this year’s numbers would be the continuation of a troubling trend have been in for months, with the new study bringing more grim proof that the monarch is in trouble. Using satellite and aerial photographs, the new study documented that 1.65 acres of forest were inhabited by monarchs during December of 2013, marking a 44% drop from the same time in 2012. “Twenty years after the signing of NAFTA, the monarch butterfly migration – a symbol of cooperation between our three countries – is in grave danger,” stated Omar Vidal, WWF-Mexico Director General. While the study focused on deforestation and forest degradation in monarch reserves that serve as their winter habitat, it points to a trio of perils contributing to declining numbers of monarchs. There are 3 primary threats to the monarch butterfly in its range in North America: deforestation and degradation of forest by illegal logging of overwintering sites in Mexico; widespread reduction of breeding habitat in the United States due to land-use changes and the decrease of this butterfly’s main larval food plant (common milkweed [Asclepias syriaca]) associated with the use of glyphosate herbicide to kill weeds growing in genetically engineered, herbicide-resistant crops; and periodic extreme weather conditions throughout its range during the year, such as severe cold or cold summer or winter temperatures. Another leading scientist who has spent three decades studying the monarch, Karen Oberhauser, professor at the University of Minnesota, added to this point, saying “Numerous lines of evidence demonstrate that the Corn Belt in the U.S. Midwest is the primary source for monarchs hibernating in Mexico,” and the region has been hit by the explosive use of Roundup-resistant crops. This has meant that milkweed, the host plant for the monarch caterpillar, is being wiped out from fields, something that Chip Ward, Director of Monarch Watch, has been documenting. “These genetically modified crops have resulted in the extermination of milkweed from many agricultural habitats,” added Oberhauser. Dr. Phil Schappert, a Canadian butterfly conservationist, added in a statement that “‘the economy first’ practices, instead of sustainable land use practices, threaten monarch habitat” in Canada, and urges his country and the United States to “implement measures that protect the reproductive habitat and feeding grounds of this butterfly. Otherwise, this spiral of population decline will continue,” Schappert added. More on GMOs vs conservation biology in Pesky Facts: unspun science for dangerous times, from Between the Lines, autumn 2014. Categories: Conservation biology, Corporate, Ecology, Genetic engineering, Global warming, Science, Uncategorized | Tags: asclepias, Chip Ward, conservation biology, deforestation, genetically modified organisms, glyphosate herbicides, GMOs, habitat loss, Karen Oberhauser, Lincoln Brower, Mexico, milkweed, Monarch butterflies, Monarch Watch, Monsanto, National Commission for Protected Areas, Phil Schappert, plant agriculture, Roundup, sustainable land use, World Wildlife Fund | Permalink. Science is objective: true or false? After teaching plant agriculture for 32 years at Guelph University, Associate Professor Ann Clark ‘retired’ in 2010 to a farm in eastern Ontario. It would be her refuge and her lab. Clark designed the farm to be “post-oil.” Here she can try out experiments for which research funding always eluded her. Since neither of her teaching specialties, grasses and organic agriculture, tends to generate proprietary profits, the corporate funders that increasingly dominate research funding were not interested. This view is powerfully confirmed by the ongoing battle over a study by French scientist Gilles-Eric Séralini & his co-researchers, on impacts of Monsanto’s genetically modified maize and its associated herbicide Roundup. In response, Clark joined with eight other scientists to publish an open letter supporting Séralini, and to “raise the profile of fundamental challenges faced by science in a world increasingly dominated by corporate influence.” Signed by an impressive roster of scientists in many countries, the October 2012 letter cites other researchers who’ve been attacked for studies questioning GMOs and Monsanto. Ann Clark’s vision of post-carbon farming and food production is here: The future is organic: But it’s more than organic! Corporate Push for GMO Food Puts Independent Science in Jeopardy. Vandana Shiva, The Asian Age, December 2012. Growing Maize Disaster (in Mexico). ETC Group, December 2012. FDA [Food and Drug Administration, US] Quietly Pushes Through Genetically Modified Salmon. Anthony Gucciardi, Natural Society, December 2012. Categories: Corporate, Ethics, Genetic engineering, Organic agriculture, Scientific integrity, Uncategorized | Tags: Ann Clark, FDA, genetically modified organisms, Gilles-Eric Seralini, GMOs, Guelph University, maize, Mexico, Monsanto, organics, plant agriculture, post-carbon, post-oil, proprietary profit, research funding, Roundup, scientific objectivity, Vandana Shiva | Permalink.